defense services for indigent defendants in Fredericksburg, Stafford, Spotsylvania and King George. In addition to his active trial practice, he currently supervises nineteen attorneys and a nine member support staff. His office hosts numerous interns from law schools around the country each summer. Over the years, Allen has represented numerous high profile clients for every type of crime in the Commonwealth. He is lead-counsel qualified in capital litigation and has successfully defended clients in five capital murder cases. 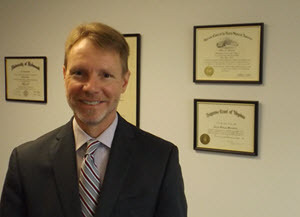 Allen is the current President of the Fredericksburg Area Bar Association. He is a former chair of the Rappahannock Regional Community Criminal Justice Board. He is also a member of various criminal defense related organizations, including the Virginia Association of Criminal Defense Lawyers and the National Association of Criminal Defense Lawyers. Following law school, Allen served on active duty as a Judge Advocate with the Army for five years. He retired from the Army Reserve at the rank of Colonel after 29 years of service in 2011.